It is the third consecutive Championship game that Batley have faced full-time opposition and they will bid to pull off a shock and claim a second league win of the season. 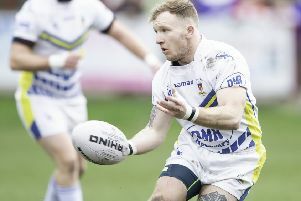 Bulldogs coach Matt Diskin is hoping their 62-6 win over Lock Lane will boost his side’s confidence ahead of a busy period of matches. Diskin said: “Our performance was a good confidence builder. We have been lacking a bit of confidence, but we weren’t bad with the ball and defensively we were pretty comfortable. “It was an okay performance and we will build on that. Widnes have won six of their opening seven matches to wipe out a 12-point deduction imposed after they went into administration. Victory at Batley would move Widnes off the foot of the table and leave them just a point behind the Bulldogs and the Vikings look set to be well supported with a decent away following expected to make the trip.